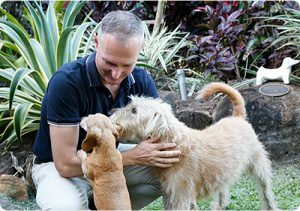 We love our pets as much as you, and our dedicated team will treat your pet with with dignity and love. Serving Far North Queensland we have staff based in Cairns, The Tablelands, Mossman & Port Douglas who are ready to help you. Your vet can also contact us directly on your behalf. We have experienced the loss of our own pets and know how much you need to have confidence in people who you can trust. 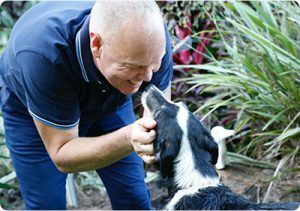 Paul started his career as a Registered Nurse and is now an owner of Community Funerals, Far North Queensland’s most respected People Funeral Company. 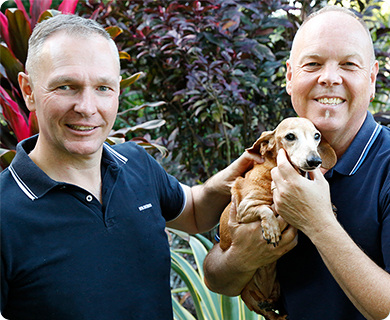 Paul started Cremation for Pets with Stephen Oldham because he wanted to bring the same level of dignity, compassion and care to the loss of a pet as he provides to his human clients. 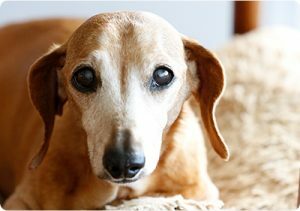 Rosa is a 14 year old miniature Red Dachshund renowned for being in-charge of the world and would have been very upset if she wasn’t given a prominent position in the company. After a period of grief following the loss of her companions Florence and Milano, she has welcomed Harold into her life, a Wire Haired Dachshund puppy. Its given her someone else to boss around and she delights in the fact that he is a failed show dog. 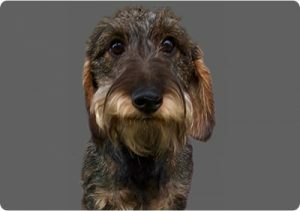 Harold is a wire haired miniature dachshund. He has no qualifications for this job and and has come to us after failing as a show dog (their loss as he would say). In the true style of a has-been super model he excels at looking handsome and doing as little work as possible.